Parker Arts and Inspire Creative Theater Company have pulled together a barn-burner in their quiet bedroom town south of Park Meadows Mall. Disney’s Newsies is a rollicking good time, bursting with a youthful exuberance and strong performances from a very young but polished cast. Since its inception in 2007 Inspire Creative has aimed to “…provide a welcoming environment for all to explore their drive to perform…” and that nowhere is that drive more evident than on the faces of the performers bringing Newsies’ turn-of-the-century street urchins to life. Newsies is based on a real-life campaign in 1899, when the newsboys of New York – orphans and street kids who sold the papers – started a strike for better pay that is credited with precipitating wide-reaching child labor reform. The musical, a theatrical reimagining of the 1992 Disney cult favorite film – follows Jack Kelly (Ethan Walker), Crutchie (Sean Davis), Davey (John Divney) and a rag-tag group of children and teenagers hawking papers across New York City. When Joseph Pulitzer (David Kouts) raises the price of 50 papers from 50 to 60 cents per newsboy in a bid to lift profit without any sacrifice of his own, the gang – who already have to pay out-of-pocket for unsold papers and largely sleep on the streets – are pushed to a crisis point. Faced with the prospect of being unable to feed themselves or their families (if they have them), they hastily form a union and strike. As the narrative tension builds with Pulitzer and his mogul pals creating a media blackout on the strike, Jack Kelly and his union are joined by Katherine (Abigail Kochevar), a budding girl reporter building a career beyond the social pages, working to shine a light on the Newsies strike. The music by Alan Menken with lyrics by Jack Feldman is decidedly Menken in “anthem-mode.” Conducted by Jordan Ortman, the orchestra’s and cast’s strong renditions of “Carrying the Banner”, “Seize the Day”, “King of New York”, and “Brooklyn’s Here” will definitely send tingles down your spine and stick with you as you leave the theater. However, it’s in the attention musical director Tanner Kelly pays to the show’s quieter numbers to balance these huge production numbers that really adds some depth to what could merely be a loud and rambunctious show. In particular I was struck by the tender “Letter from The Refuge” sung by Davis’ Crutchie, a poignant number that could be unduly sentimental in the hands of a less confident actor. Similarly, Walker and Kochevar’s performance of “Something to Believe In” underscores the gentle growth in Katherine and Jack young relationship. Kochevar also has a standout solo number in Katherine’s “Watch What Happens.” A star-turn of song and dance addressing the character’s writer’s block, her battles against a sexist workforce, her attraction to Jack Kelly, her commitment to the newsboy cause and the cause of all exploited children, as well as the capacity for a writer to help affect change by demanding justice – in just about three minutes and four seconds. The Newsies’ frustration, exuberance, revolt and triumph here are ultimately told through dance – because this is a dance musical, make no mistake. Choreographer Tobi Johnson-Compton has crafted a balletic and athletic explosion on the Parker stage, befitting the fierce design created by Christopher Gattelli, choreographer of the original Broadway production. Johnson-Compton focuses the Newsies ensemble’s boisterous, playful energy into a distinctive form, while never losing that sense of streetwise scrappiness that underlies the Newsies’ strength. The staging under Director Liane M. Adamo is tight and distinctive, and her work with a resoundingly youthful cast brings strong performances to bear. Her use of the set (created by Production Designer Ralph Newman and Lighting Designer Jacob Welch) – a series of moving, interlocking wooden structures, flying set pieces, and backdrops, each invoking the tenements and oppressive industrial environment of turn of the (19 th ) century New York – is a joy to behold, utilizing Parker Arts Center’s immaculate and modern stage to its full potential. While the left-wing politics inherent in the story are never brought to the forefront here (probably for the best in dyed-in-the-red Douglas County), Parker Arts and Inspire Creative have fashioned a Newsies that is an accessible, relatable and stunning song-and-dance production. Adults and kids alike will find a stage full of actors, singers and dancers excited share their passion for performance. 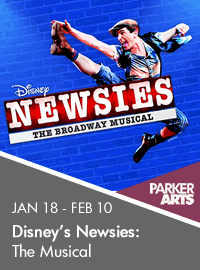 Sieze the day and go see NEWSIES at Parker Arts Center playing now through February 10th. For tickets or more information, contact the Parker Arts Center Box Office by calling 303-805-6800 or online at www.parkerarts.org. The PACE Center is located at 20000 Pikes Peak Avenue in Parker, CO.